While we have reviewed more than a few different fitness watches, there is one brand we have not really focused on – at least, until today. That brand, of course, is Suunto. As with many other brands, they offer a wide variety of fitness watches, some very technically oriented to a specific sport or activity, and others a bit more, shall we say, generalist. Today, we check out that latter category, with the Suunto 3 Fitness. For the impatient reader, here’s the quick rundown. The Suunto 3 Fitness is affordable, offers on-the-wrist heart rate, and can act (somewhat) as a smart watch, with various notifications popping up on your wrist from your phone. As we’ve established over the last year or two, smart watches are not particularly my thing, so I was not as interested in that. What I was interested in was the fitness tracking and the sleep tracking, and we’ll get to those in just a moment. 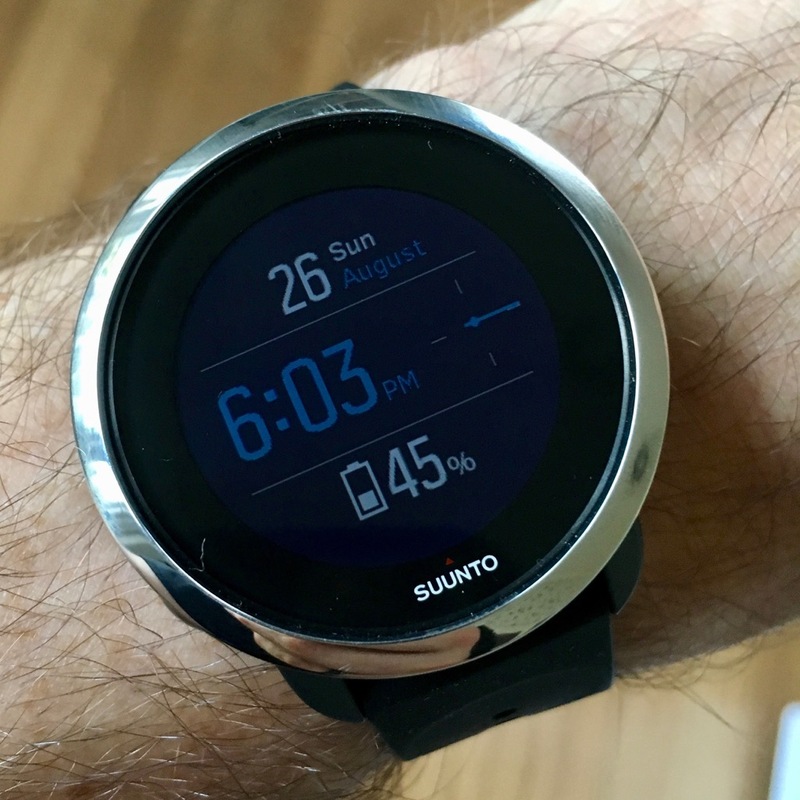 As far as fitness watches go, the Suunto 3 Fitness is a fairly svelte option, coming in at just 43mm in diameter and 14.3mm thick (a good portion of that is due to the HR sensor). Being that compact, you might think the battery would suffer, but that was not my experience. Using it to head to the gym in the mornings and then wear the rest of the day, I was comfortably getting 4-5 days out of it before I needed to recharge. Just keep an eye on the battery level (easily toggled with the button at 10 o’clock), as if it gets too low, it won’t engage the fitness tracking. As far as the fitness tracking go, that’s a simple affair to get into with the Suunto 3 Fitness. Press the button at the 2 o’clock position to go “up” in the menu, then the one at 3 o’clock to go into Fitness mode, and you’re set to go. If it’s the first time in it for the day, it will give you what your plan for the day is supposed to be (ie, how hard should you push today), and then you can get into what activities you’re going to do. There are a variety pre-loaded on the watch, and as you use them, those bubble to the top of the list so they’re simpler to get into. When you’re done with your session, you use the 2 o’clock and 4 o’clock buttons to pause, resume, or stop your session. Once you tell the watch how you think it went (a variety of smiley faces), it will sync the data over to your phone (provided you have the Suunto app up and bluetooth on). Once it’s synced, you can view the data from the Suunto 3 Fitness on your phone, or on the Sports Tracker website. That was one confusing bit for the Suunto, the apps. You’ve got the basic Suunto one, and that’s used for the configuration of the watch and so on. If you didn’t know better, though, you’d think you’d need to use their MovesCount app (and site) to see the data, but that was not the case. It’s this Sports Tracker that you need to use. Perhaps others may not care about the web side, but I like having a place other than my phone to check history. In terms of actually tracking the activities, I felt the HR monitor was fairly accurate, as compared to the other options I’ve got available (both wrist and chest, as well as on-machine at the gym). It may not agree 100%, but it’s close enough for us amateurs, and keeps you directionally set. When it comes to step counting, I did find it could vary wildly from my Fitbit One, but that’s the difference between a wrist-mounted and clip-mounted tracker – it’s just different movements being tracked. And, at the end of the day, they would both end up within about 5% of each other. And that’s the story with all of these fitness trackers. They may not always be 100% in sync, but if you’re using the same thing over time, you’ll be able to compare from day to day. For the sleep tracking, I did like how the Suunto 3 Fitness would automatically start tracking. You set normal sleep and wake times, and then it sees how you do against those. With the addition of the HR sensor, it can track what your pulse is doing throughout the night, and gives you a nicer dive into some details (ie, how deep did you sleep and so on). These details are viewable on the watch and in the Suunto app, but not on the web. Also, try as I might, I did not see any way to force it into sleep tracking mode (ie, a mid-day nap). When it came to wearing the Suunto 3 Fitness, this was (almost literally) as light as a feather. Coming in at just 34g, I think this is the lightest watch I have ever tested. This is due to the materials in the case construction, and is great, as you don’t want anything additional weighing you down as you workout. The thing about the watch that really surprised me was the crispness of it’s screen. Whether I was indoors or outdoors, just checking the time or working out, I never had a problem seeing the screen. Suunto did an excellent job of using the colors available in the various modes, and keeping them in stark contrast to the black of the screen. This ensured readability, and made for particularly vivid displays in natural sunlight. Previous articleBuckle up, it’s seatbelt strap time again with Cincy Strap Co.